Interstate 172 connects I-72 & U.S. 36 with the Adams County seat of Quincy and the Illinois 336 expressway north to Macomb. The rural freeway passes east of Quincy along bluffs rising above the Mississippi River while the southern extent traverses the river flood plain in Pike County. I-172 is also part of Illinois 110, the Chicago-Kansas City Expressway. Referred to as the CKC for short, the multi state route overlaps with other Interstates and U.S. highways as both an alternate route to Interstates 55 and 70 and an economic generator for cities located on the route. IL 336 takes over from the ending Interstate 172 as an at-grade expressway north toward Carthage and east to Macomb. The expressway was cosigned as part of the CKC (IL 110) in 2010. 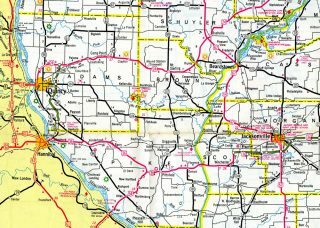 Long range plans call for the IL 336 alignment to extend east beyond Macomb to Bardolph and Cuba; northeast around Canton; and east parallel to IL 116 to Interstate 474 at Bellevue. While incorporating some grade separations and interchanges, the overall route is not planned as an Interstate standard facility. More information is available at the Illinois 336 Peoria to Macomb Study web site. 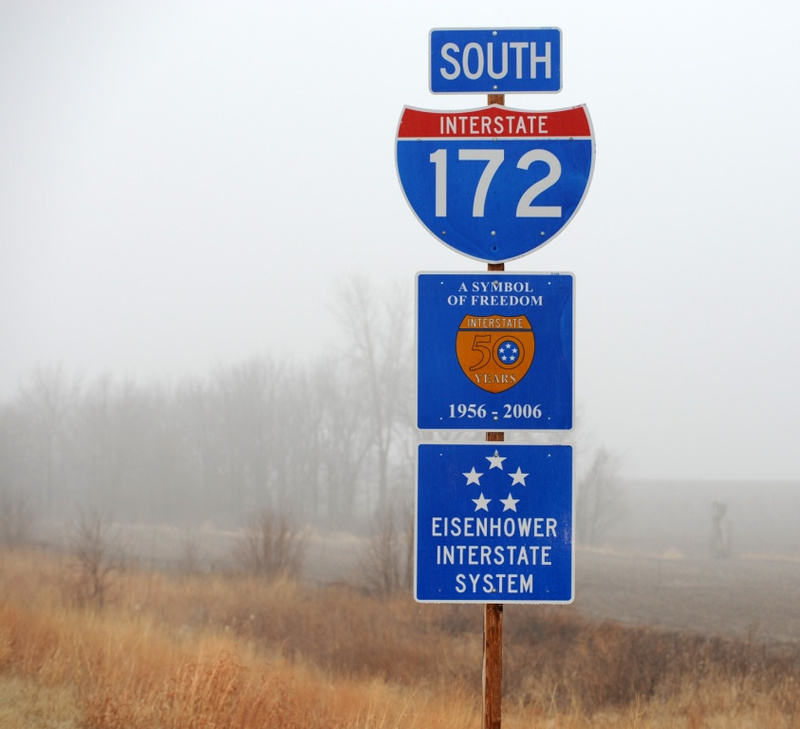 Illinois originally submitted Interstate 172 as the new designation for the Central Illinois Expressway to AASHTO. The limited access highway was signed as U.S. 36 and completed in 1991 from I-55 at Springfield to Illinois 336 near Hull. AASHTO approved the numbering on June 9, 1991, with it contingent upon Federal Highway Administration (FHWA) approval. No signs were erected however, and by 1995 a new numbering plan emerged. As approved by AASHTO on April 22, 1995, the Central Illinois Expressway was renumbered instead as a westward extension of Interstate 72. 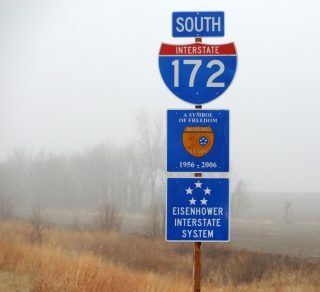 The I-172 designation was then applied to 17-mile long freeway section of Illinois 336 as it spurred north from the proposed I-72 to Quincy and U.S. 24. The original Illinois 336 freeway extended north from a two-lane alignment (old Illinois 79) connecting with U.S. 36 at Shepherd. A portion of the old alignment remains along 130th Street and the north side frontage road of I-72. An older sign array for I-172 and the Great River Road that was posted ahead of the Adams County line on the freeway northbound. Photo taken by Jeff Royston (02/05/08). Interstate 172 initially traverses flat agricultural areas south to Ewbanks. The shield assembly here was replaced when the Chicago-Kansas City Expressway was established in 2010. Photo taken by Jeff Royston (02/05/08). Interstate 172 & Illinois 110 (CKC) turn northwest ahead of the rural diamond interchange (Exit 19) with U.S. 24. U.S. 24 represents a cross state route from Quincy east to Peoria and Sheldon. Photo taken by Jeff Morrison (04/20/08). An end shield for I-172 precedes the off-ramp (Exit 19) to U.S. 24 near the community of Fowler. U.S. 24 connects the freeway with Illinois 96 north to Keokuk, Iowa to the west and the Brown County seat of Mt. Sterling 30 miles to the east. Photo taken by Jeff Royston (02/05/08). U.S. 24 travels north from Downtown Quincy to briefly overlap with Illinois 96 before turning due east to Interstate 172, Illinois 110 (CKC) and Illinois 336. Photo taken by Joseph Barnes (08/14/16). Interstate 172 heads south to Interstate 72 between the Mark Twain Bridge and Hull. Illinois 110 accompanies the freeway from the end of Illinois 336 to I-72 west into Missouri. Photo taken by Joseph Barnes (08/14/16). The control cities for Illinois 336 north changed from Ursa and Mendon to Carthage and Macomb as the expressway was lengthened northward to U.S. 136 and U.S. 67. Photo taken by Jeff Morrison (04/20/08). 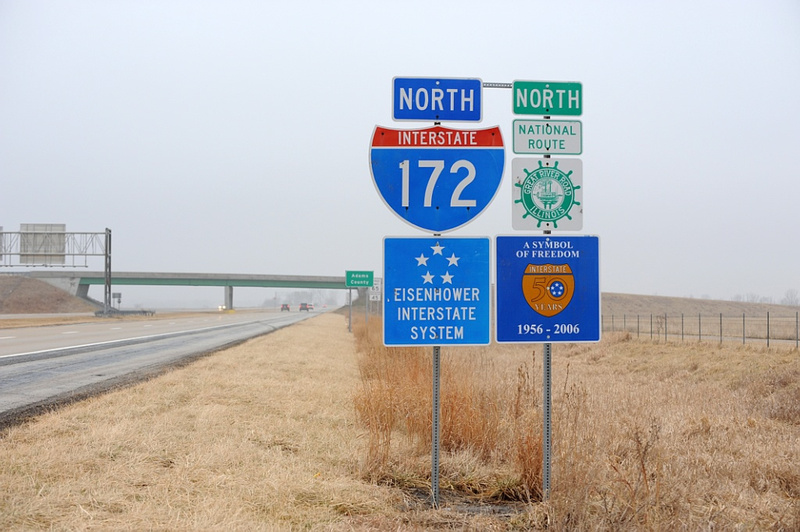 U.S. 24 travels 2.4 miles west from Fowler to meet Interstate 172 south, Illinois 336 north and the Chicago-Kansas City (CKC) Expressway. Photo taken by Joseph Barnes (08/14/16). Illinois 110 (CKC) combines with Illinois 336 along an expressway north to U.S. 136 at Carthage and U.S. 67 at Macomb. Photo taken by Joseph Barnes (08/14/16). Interstate 172 & Illinois 110 bypass Quincy to the east through two interchanges. The second joins with Illinois 104 east to Quincy Regional Airport (UIN). Photo taken by Joseph Barnes (08/14/16). 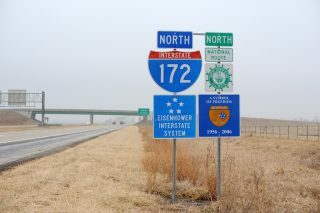 The southbound control cities for Interstate 172 are Hannibal, Missouri for I-72 west and Pittsfield, seat of Pike County and former end point of U.S. 54, via I-72 east. Photo taken by Joseph Barnes (08/14/16). The guide sign for Illinois 336 north from U.S. 24 west was replaced to show Carthage and Macomb, following extension of the expressway north to U.S. 136. Photo taken by Jeff Royston (02/05/08). Illinois 336 proceeds south from the intersection with County Road 1800 North near Bloomfield to become Interstate 172 at the diamond interchange (Exit 19) with U.S. 24. Photo taken by Jeff Morrison (04/20/08). The first confirming marker for Interstate 172 south. I-172 & Illinois 110 (CKC) turn southwesterly from the exchange with U.S. 24 to the eastern outskirts of Quincy by Hickory Grove. Photo taken by Joseph Barnes (08/14/16). Interstate 172 & Illinois 110 (CKC) arc around the settlement of Fall Creek to meet Interstate 72 at a trumpet interchange (Exit 0) in one mile. Photo taken by Joseph Barnes (08/14/16). Interstate 72 & U.S. 36 travel southwest five miles from the ending I-172 to Hannibal and six miles southeast to Hull. Illinois 110 combines with the route west to become Missouri 110 across the Mark Twain Bridge. Photo taken by Joseph Barnes (08/14/16). An end shield for Interstate 172 stands at the old Illinois 79 overpass beside the Pike County line. Photo taken by Joseph Barnes (08/14/16). Interstate 72 & U.S. 36 (Central Illinois Expressway) venture east 65 miles to Jacksonville and 94 miles to Springfield. Photo taken by Joseph Barnes (08/14/16). Former exit numbers for Interstate 172 referenced the mileage from I-72 at the Missouri state. This numbering scheme is uncommon, but not unique in the Interstate system, as exit numbers at the east end of I-630 use the I-30 mileage from the Texas state line and those at the west end of I-195 use the mileage of I-295 from the Delaware state line. Photo taken by Brian Dowd (08/03/02). Sign changes made by 2007 assigned the westbound ramp as Exit 0 while the mainline continuation to I-72 east was unnumbered. U.S. 36 remains unposted on all signs at the exchange. Photo taken by Brian Dowd (08/03/02). A left-hand ramp (Exit 4) connects Interstate 72 & U.S. 36 west with Interstate 172 north. Until September 2000, this interchange marked both the western end of I-72 and the southern end of I-172. With the completion of the new Mark Twain Bridge over the Mississippi River, Interstate 72 was extended into Missouri. Photo taken by Jeff Royston (02/05/08). The mainline defaults onto Interstate 172 & Illinois 110 (CKC) north to Quincy while I-72 & U.S. 36 turn southwesterly three miles to Illinois 106 (old U.S. 36) and four miles to Hannibal, Missouri. Photo taken 05/07/10. Westbound I-72 & U.S. 36 reach the split with I-172 north, 21 miles east of Monroe City, Missouri. The Mississippi Great River Road system leads both north to Quincy via I-172 & IL 110 (CKC) and west on I-72 to the Mark Twain Bridge. Photo taken 05/07/10. Interstate 72 & U.S. 36 angle northeast from the Mark Twain Bridge across agricultural areas to connect with Interstate 172 north to Quincy. Named the Purple Heart Memorial Highway, the freeway enters the Abraham Lincoln National Heritage Area. Photo taken 04/13/13. Illinois 110 (CKC) departs from I-72 east for I-172 north to Illinois 336. The Great River Road system also extends north along Interstate 172 to Illinois 57. Photo taken by Joseph Barnes (08/12/16). Interstate 172 begins and travels north 15 miles to Quincy while providing part of a route to Macomb via Illinois 336 and U.S. 136, 82 miles to the northeast. I-72 & U.S. 36 continue east to Pittsfield (31 miles) and Springfield (96 miles). Photo taken by Joseph Barnes (08/12/16). Exit numbers were previously assigned to both I-172 north and the Interstate 72 eastbound mainline from when Illinois 336 traveled south to East Hannibal. Photo taken by Brian Dowd (08/03/02). The trumpet interchange at I-72 and I-172 previously represented a rare instance in the Interstate system where every movement was assigned an exit number. Photo taken by Brian Dowd (08/03/02). A left-hand ramp (Exit 4) remains from when Illinois 336 was the mainline route by nearby Fall Creek. Panels for I-72 east were replaced by 2008 to omit Exit 4B. Photo taken by Brian Dowd (08/03/02). Page updated September 8, 2016.